When the news hit last week that Steve Jobs would be giving the keynote address at Apple’s 2011 Worldwide Developers Conference, it seemed as though it was good news regarding his health, which has been in the spotlight since he was diagnosed with pancreatic cancer. But today at WWDC, Jobs’ trademark black turtleneck hung off an incredibly thin frame, raising even more concerns about his health situation. This reading of the situation seems to be in total opposition with the views on Twitter, with nearly every tweet I’ve seen regarding Jobs’ health saying that he didn’t look good. If you go by the market, they also seem to agree that he didn’t look too great. 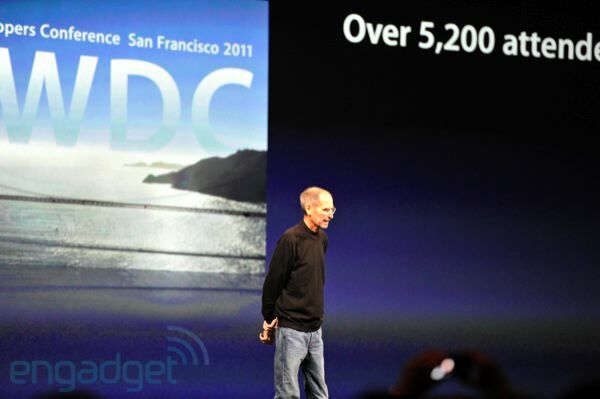 Jobs received a warm ovation as he took the stage, coming out to an ironic playing of James Brown’s “I Feel Good.” During the keynote, he discussed their new Mac OS X Lion, iOS 5, and their new cloud services entitled iCloud. Here are a couple of photos snapped of Jobs, the first courtesy of Engadget and the second courtesy of tweet from xdamman, via his Instagram account. Scott BeattieSteve Jobs looks skeletal. Poor guy can’t be in the greatest health. Jason GrigsbyFor example, just favorited a tweet about how Steve Jobs looked in poor health on stage. Favoriting it feels wrong in many ways. Brad PurchaseCan’t help but notice how sick Steve Jobs sounds.  get better soon buddy. BinremindedSteve Jobs is a reminder that wealth can’t buy you health. From what you’ve seen, what do you think? Is Verizon Customer Service The Worst Thing Ever?